If kids see something that looks like candy, better believe they’ll touch it. And this instinct has created a threat for children’s eyes, based on new research published Thursday in JAMA Ophthalmology. The report cites a nationwide spike in eye-related chemical burns due to laundry detergent pods. The ever-popular pods now account for a quarter of chemical-related eye injuries in kids aged 3 to 4. More than 17,000 children were poisoned by laundry detergent pods from 2012 to 2013. But these eye burns present a special danger due to the chemistry of liquid detergent. 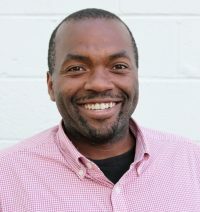 His investigation into detergent pods started in October, after Haring and his colleagues published a separate study about the overall prevalence and causes of chemical eye burns in the U.S. One might expect most of these injuries to occur among adults working industrial factories, where chemicals might splash into an unguarded eye. But to their surprise, they had found 50 percent more chemical eye burns in young children versus adults. Then, the news cycle took over and offered some extra clarity. For the new study, the researchers dug into the issue by turning to the National Electronic Injury Surveillance System (NEISS), which gathers emergency room reports from approximately 100 hospitals peppered around the country. For the last 30 years, the system has served as barometer for U.S. injury prevalence. Concentrated detergent tablets and pods have existed since the 1960s, but Haring and his team focused on recent years, given the pods’ popularity jumped after Procter & Gamble released new liquid versions in 2012. Sales of the liquid detergent capsules increased by 150 percent between 2012 and 2015, according to The Wall Street Journal. 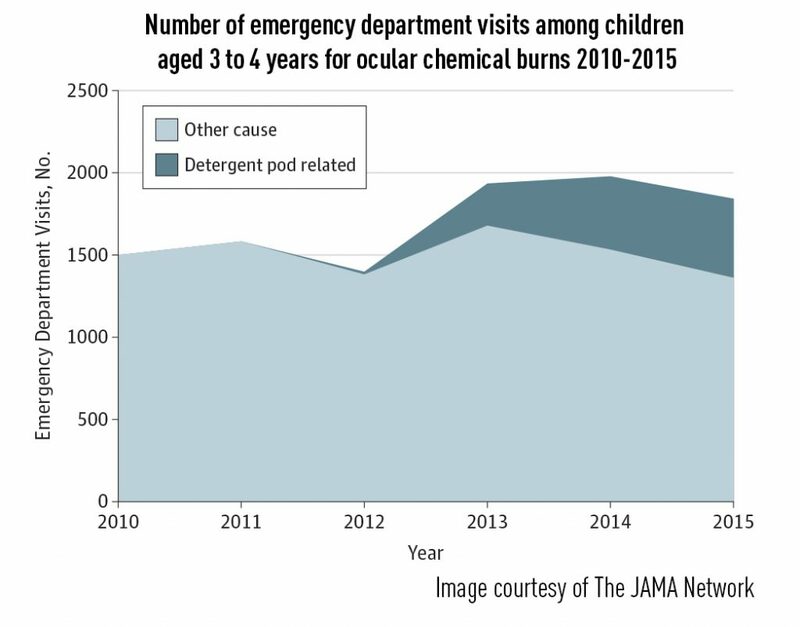 Approximately 1,500 preschoolers (aged 3-4) visited emergency rooms in 2010 and 2011 due to chemical eye burns, with no cases due to laundry detergent pods. The year 2012 notched 12 cases, and the following year: 262. And in 2015, the last year with available NEISS data, 480 tykes went to the emergency room with laundry detergent pod-related ocular burns. Haring expects this trend to continue in 2016, though the American Cleaning Institute claims a standards change in December 2015 ensured that packets can withstand the grasping strength of a child. Upon splashing into exposed tissue, like one’s eyeballs, alkaline chemicals in liquid laundry detergent cause necrosis, wherein the tissue essentially liquefies. Photo by WIN-Initiative/Getty Images. Upon splashing into exposed tissue, like one’s eyeballs, alkaline chemicals cause necrosis, wherein the tissue essentially liquefies. Alkaline chemicals tend to burn faster and more severely than acidic chemicals. The burns can cause significant pain if the chemicals hit the cornea — the nerve-packed clear dome that covers the colored part of your eye. Levin said alkalines “kill tissue in a way even acids don’t do” because exposure and necrosis can cut off blood circulation, making the damage hard to spot in the eye. The NEISS data occurred most often when a child squirted the detergent into their eyes or burst a packet onto their hands and touched their face. One limitation of the study is the NEISS numbers come only from emergency rooms, meaning visits to community physicians and urgent care facilities aren’t counted. Also, the surveillance system doesn’t provide information on the long-term outcomes of patients, but Haring wants to conduct such a study in the future. A longer wait could mean a larger injury. Doctors can treat the burns with medical ointment or drops, Lehman said, with wounds healing within days to weeks. 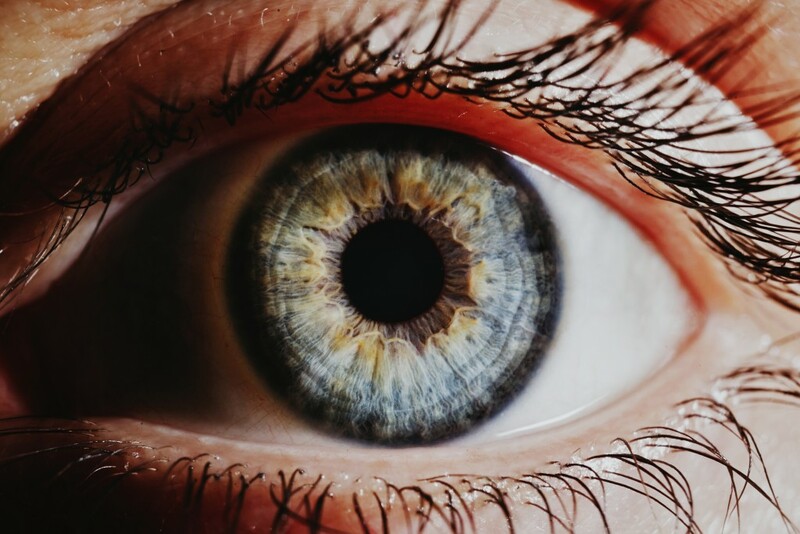 But the most severe injuries require surgery to replace damaged corneas or repair eye tissue. Prevention is also key in their opinions. 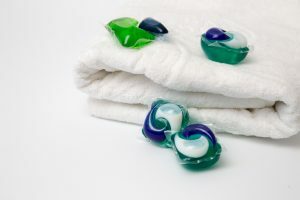 Levin said manufacturers might want to try to make laundry detergent pods less attractive to children by removing bright colors, while Haring called on parents to put these things out of reach.